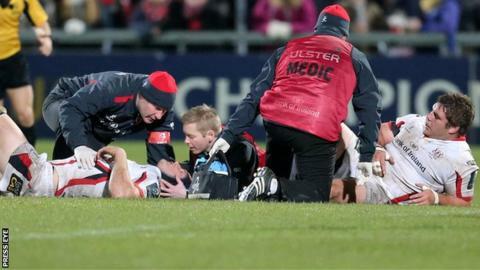 Ulster coach Neil Doak is optimistic that lock Franco van der Merwe will be fit for Sunday's European Champions Cup game against the Scarlets. Stuart Olding, Stuart McCloskey, Nick Williams and Wiehahn Herbst have been ruled out after being injured in Saturday's win over the Welsh club. Van der Merwe was also forced off in the win with suspected concussion but appears to be recovering well. "We're confident Franco will come through," said Doak on Tuesday. "He's still got to do a few bits and pieces with his return to play protocols." Backs Olding (concussion) and McCloskey (elbow) are out along with forwards Herbst and Williams, who have hamstring injuries. On the plus side, Ireland centre Luke Marshall could make a return to the squad after being out for over six weeks because of a knee injury. Ulster are seeking another bonus-point win over the Scarlets to keep their European hopes alive. All five players were injured in Saturday's 24-9 victory at Kingspan Stadium. Centre McCloskey is facing a lengthy spell on the sidelines after sustaining a "significant" elbow ligament injury. Ulster's outside hopes of getting through the group stages for a fifth year in a row were boosted by Leicester's win over pool favourites and cup holders Toulon. The French club still head Pool Three on nine points, with Leicester on eight and third-placed Ulster on six. After this weekend's game with the Scarlets, Ulster then face a daunting trip to Toulon in January before the final pool fixture at home to Leicester. Doak believes Pool Three is "now wide open" although he knows full well that his side will have to win their three remaining games to have any chance of qualification. "We know if we pick up three wins, we are going to be there or thereabouts," added the Ulster coach. However, first up Doak is anticipating something of a backlash from a Scarlets side likely to be chastened by their defeat in Belfast. "We negated a lot of what the Scarlets try to do and they will be a little bit frustrated. "We know they are going to be a different animal this weekend and we've got to make sure that we increase our productivity off our set-piece and be just as clinical as we were on Saturday."